When securing items, coiled thethers will do the trick for many applications at retail, in offices and inside warehouses. You can attach them to retail shelves, to wire racks, to cash registers and on counters; they are useful in shipping/receiving departments and so on. They secure with adhesive mounting and have either pens attached, spit rings or adhesive pads. The tethers can be stretched out and they recoil back to position. 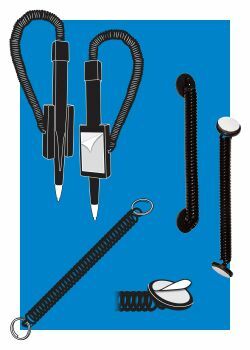 Great for hanging signage, swatch books, tags, magnifying cards and our pen versiion is of course great for payment signature or sign-in forms. 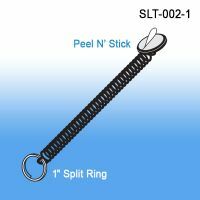 Minimum quantity for "Coiled Tether with Split Ring & Peel n' Stick Adhesive Disk Pad, SLT-002-1" is 10. 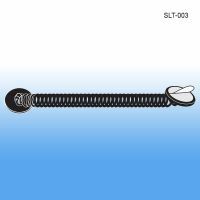 Minimum quantity for "Coiled Tether with Two 3/4" Peel n' Stick Adhesive Disk Pads on Both Ends, 4.5" Extends to 36", SLT-003" is 10. 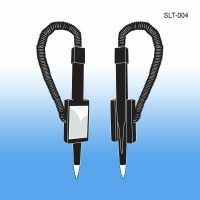 6" normally and coiled tether extends to 40"
Minimum quantity for "Coiled Tethered Pen with Peel n' Stick Pen Holder, 6" extends to 40", SLT-004" is 5.